Anyone who has been exposed to me for any period of time knows of my absurd love of music from the 1950s and 1960s. 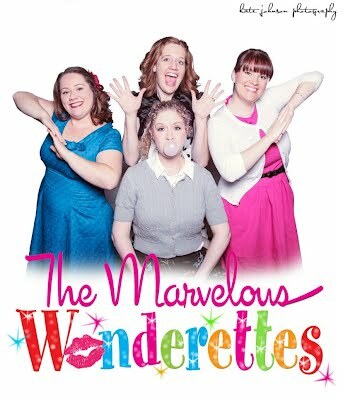 Now that you know the soundtrack, you are probably wondering, "Who are the Marvelous Wonderettes?" I suppose the more appropriate question would be "What is..." considering this is a musical of the most nostalgic proportions. To give a little history, once upon a time, there was a small, blackbox theater and a playwright (Roger Bean). He wanted to write a musical about girl song leaders singing 50s and 60s songs, but in order to accommodate the actresses and the quaint size of the theater, he needed to fashion the show in such a way that the performers could remain on-stage throughout the entire show. And so The Marvelous Wonderettes was born. Straight from Midvale Arts' website: The Wonderettes is an epic journey down memory lane to Senior Prom 1958 at Springfield High School. At prom we meet the Wonderettes - Betty Jean (Paige Moore), Cindy Lou (Melody Chapman), Missy (Kristen Fox) and Suzy (Megan Smyth), four girls with hopes and dreams as big as their crinoline skirts with voices to match. You can vote for the Prom Queen and learn about the lives and loves of these four energetic performers. We are treated to the girls performing beautifully arranged renditions of classic 50s songs. After intermission, we see how their friendships have changed and endured as we follow the girls to their ten-year high school reunion. The Wonderettes perform high-octane and soulful renditions of classic ‘60s tunes. Don’t buy a ticket – Buy two! It’s a show you’ll want to see twice! The thing is, they aren't joking about buying two tickets - you really will want to see it twice, at least I do. I'm currently trying to finagle my schedule to get back. You see, typically I write reviews of shows in as unbiased of a manner as possible - extracting myself from my friendships and trying to point out the positives of a show more than the negatives as long as those negatives didn't remove me from the feel of the show. But this show? In addition to the oldies tunes, also in no shortage is my love for these performers and the pro team behind the musical, as I know them all. These ladies have touched and changed my life both personally and professionally. I am their biggest fan and their harshest critic. After all, when you love someone you know everything they are capable of and you are starkly aware of where they believe their flaws are. Disclaimer given. My honest opinion? I loved the show. I talked through the performances with several friends after attending preview night and we all agreed that the only real downfall, and I feel like I say this a lot, was not the fault of any performer or director. The plot is a bit frantic for the first act - showing the vibrancy, youth, and pettiness of teenage girls and young love. As we move into the second act, the plot slows down and it feels like we are being told, "High school is the pinnacle of all things amazing, your life will only get strange from here and it will be all the fault of men." Even then, the characters are written with room to actually develop instead of being flat like most jukebox musicals. The Marvelous Wonderettes is not a show with big production value or a life-changing plot, but you won't care one bit about that as you sit back and enjoy every minute. It's one of those shows I don't really care to critique or dissect because that might ruin the charm for me - the charm of this throwback to a more innocent time. Were all the harmonies perfect? Nope. Were there squeaks? Sure. Do you care? Not at all, the good far outweighs any flaw. I've seen these gals perform before and I have never heard them sing like this. In fact, the friends I was sitting with could not tell, for the most part, which girl was singing which harmonic part - a true sign of musicality. And lets talk about how much you will laugh. I am not an out-loud laugher to the extent that I could be heard on stage from the audience. And you know what? One of my friends wrote me, "I loved hearing your laugh." Yes, I laughed that hard. My hatred of audience participation? Blown to smithereens at this performance. The Mr. Lee number where they make an audience member a character and pull him on stage is supreme...and I don't want to spoil that for you so I will leave it at that. The costumes made me jealous - so bright, colorful, vintage-looking, and fun! In the second act they change to 1960s costumes and it just gets better from there. I want so badly to write so much more and give away every fun little morsel about this show, but I don't want to ruin it for anyone. This may sound strange, and perhaps like a dig, but I truly mean this as a compliment - if you know any folks age 55 or older, you need to take them to this show. Need a night out with the grandparents? Perfect. They will be all smiles. You can still catch the show at 455 West 7500 South July 17, 18, 19, 20 & 21st - that's tonight through Saturday. Take blankets, chairs, and picnics if you so desire. Tickets are $7 general admission, discounts for children, seniors, and family passes. You can also purchase tickets online here. They begin the show singing, "Mister Sandman, bring me a dream..." And that dream is you in the audience. Go. Now. They only want to be with you. This is a great review, Larissa! I only wish I were moving back soon enough to see the show! I was only your blog once. You made fun of me...not looking to return anytime soon. Murray Arts in the Park: Hello, Dolly!